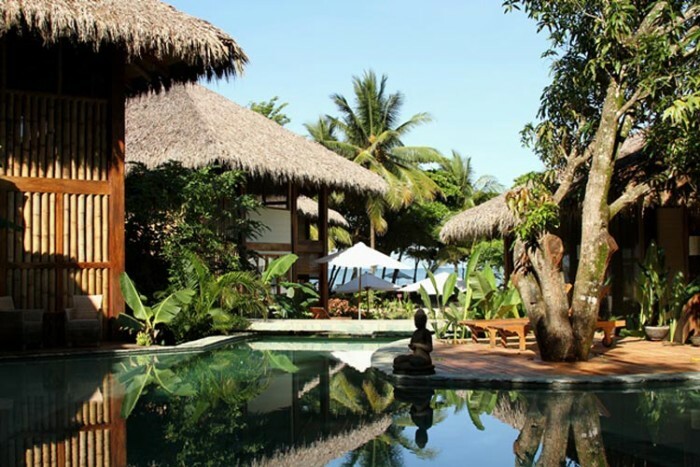 Pranamar Villas and Yoga Retreat is situated along the shores of the Nicoya Peninsula’s spectacular beach Santa Teresa. This oceanfront ecolodge is set in a rural location and surrounded by stunning nature. This lodge is within close proximity of El Carmen Beach and just a minutes from the Cocal Beach and also close to the Hermosa beach. People who are planning for a tranquil vacation and want to enjoy Yoga retreat with all the comfortable facilities, they will find this lodge perfect and its natural setting. Not only the yoga lovers but also the nature lovers will enjoy the tropical beauty and nature in the friendly and exotic ambiance. In this ecolodge, you will find villas that are elegantly designed and constructed with Costa Rican bamboos and hardwoods. There are plenty of doors and windows that allow natural light enter the villas and also overlooks stunning views of the ocean and surrounding area. Imported, hand crafted Indonesian furniture are used for the decoration of the villas. There are open-air bathroom surrounded by amazing tropical garden and allow the guests feel more connected with the nature. This bathroom is featured with luxurious granite stone tubs. If you stay at one of the four poolside villas, you will enjoy private entrance to the pool. These villas feature bedrooms with air conditioner, fans, 1 king or 2 king beds and 2 twins. These villas also provides WiFi connection, laptop size security safes, and also small bar fridge. If you want to enjoy watching ocean view from your room, you can stay at the two ocean front luxury villas that are nestled on the beach front and overlooks amazing sunset view. In these ocean front villas, you will find a full kitchen, extra spacious rooms and oversized verandas. Pranamar Villas and Yoga Retreat also have some bungalows that are made of sustainable pinewood with an ecological consciousness. If you stay at the bungalows, you will enjoy some tranquil time or fun time at the ocean-facing decks, living space or at the private lounging area. Featured with king bed, air conditioning, fans, garden bathroom, large deck including hammock and table, this bungalow offers direct view of the ocean view. You can enjoy some solitary time at the living space that is furnished with single sofa couch or bed. This bungalow also equipped with small refrigerator, laptop size security safe, and coffee maker. Featured with king bed, garden bathroom, air conditioning, fans, small laptop size security safe, coffee maker this bungalow overlooks amazing garden view. There is a large deck furnished with table and lounge chairs and a small living space with single sofa couch or bed. People who have to use wheelchair, they can choose this bungalow as it has wheelchair accessibility. This spacious bungalow is featured with king bed or 2 singles, air conditioning, fans, laptop size security safe and coffee maker. There is a deck furnished with table and chairs and also has living space with single sofa couch or bed. If you visit Pranamar Villas and Yoga Retreat for enjoying a family getaway or with a group of friends for enjoying a memorable vacation, you can stay at the Kula House. Kula House is ideally designed for accommodating 7 persoms and provides 2 bathrooms, full kitchen, air conditioning, fans, and also laptop size security safe. This house offers a homely like environment and provides all the luxurious amenities that you can have in a hotel. There are large windows and doors leads to an enormous deck. You will find a bedroom in the downstairs that is adjacent to a small living room and kitchen. In the upstairs there is a giant bedroom and bathroom that overlooks stunning views of the ocean. There is a terrace with plenty of space and ideal for enjoying some relaxed time at the same time to enjoy watching the amazing natural beauty of the surrounding area and the ocean. Yoga lovers can enjoy Yoga retreat-Wellness Treatment and Bodywork and Wellness Treatments offered by the Pranamar Villas and Yoga Retreat. While staying at this eco lodge, you can enjoy abundance of physical workouts and treatments that are beneficial for physical health as well as for psychological health. Organic products are used for the massage treatments and after taking the treatments you will find yourself tension free and relaxed, rejuvenated, refreshed and energetic. This lodge offers a variety of Yoga retreats, workshops throughout the year and all the sessions are guided by International instructors and also by its resident yoga teacher Nancy Goodfellow. All-inclusive Yoga vacation is also offered by this eco lodge and it can be customized depending on the practitioner’s desires and needs. You can also join the daily classes that are guided by certified, professional instructors. Pranamar Villas and Yoga Retreat encourages its guests to follow the sustainable living. Throughout the hotel you will find all the things are eco friendly such as biodegradable soaps and cleaners. It uses independent septic system that recycles water into the irrigation of its gardens. For the electricity it uses energy saving light. It offers donation-only Yoga classes in Spanish and the local community can join these classes and 10% of the profit are donated to the local schools or organizations. 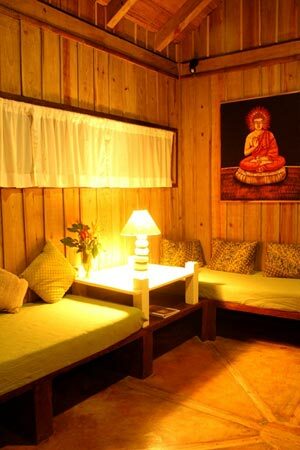 In this lodge you will find an open air restaurant called ‘Buddha Eyes Restaurant’. This restaurant serves delicious meals and snacks. Constructed with bamboo roofs and archways, this beautifully designed restaurant offers relaxing and exotic environment. At the time of having your food, you will also enjoy the amazing view of the ocean and swimming pool. All the dishes are prepared with organic fruits and vegetables and with the local fish and meat.